Please note that we only carry the large (14-ounce) version of this creamy cashew butter, as this size provides the best value. Naturally sweet, this rich and satisfying cashew butter can be eaten on its own, with apple slices, or added to a variety of salad dressings, smoothies, shakes, sauces, and a number of other dishes. 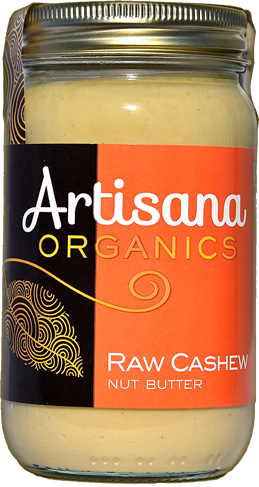 Artisana's raw cashew butter is handcrafted from fresh (not roasted) nuts, and is made into butter using a low-temperature blending process (below 115 degrees F.) that preserves all of the nutrients that are naturally abundant in cashews. It's made with 100% certified organic cashews, with no preservatives or other additives, in a facility that does not process any peanut, gluten, or dairy products. Keep your heart and blood vessels healthy by providing your cardiovascular system with a steady stream of healthy, monounsaturated fatty acids. Build and maintain strong bones and teeth by supplying your body with a rich supply of magnesium, which is just as important to the physical structure of your bones and teeth as calcium. Promote healthy blood pressure - magnesium-rich cashews can help keep your blood vessels relaxed, combating the negative effects of poor dietary choices and stress than can cause high blood pressure. Keep your nerves relaxed - this is also accomplished by magnesium, which promotes a healthy, relaxed tone in your nerves and muscles by acting as a natural calcium channel blocker. Decrease muscle cramps and soreness - also due to the high magnesium content of high quality cashews. Promote deep, restful sleep through the relaxation effect that magnesium has on your nervous system and muscles. Keep your joints, bones, and blood vessels flexible by supplying your body with significant amounts of copper. Prevent premature aging and disease by supporting the antioxidant activity of a powerful enzyme called superoxide dismutase. 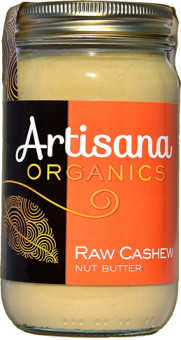 Ingredients: Organic, raw cashews - certified organic and kosher. Cashew Butter arrived safely with fast shipment time! It has a great flavor and I look forward to reaping the magnesium benefits it will provide. Organic milk thistle tea, traditionally used to support liver health.